About 2100 years ago Caesar Augustus was the most powerful man on earth. Everyone knew who he was, and his word was law. Like all other men, he died. As time went on his impact on the world began to fade. Another man of the time was Jesus of Nazareth. He had no position of power in the world. He never wrote a book. He had a few students who followed him around for a couple of years before he was executed as a criminal and they all scattered. But today the influence of Jesus is everywhere, and he has more followers than ever. Caesar Augustus is most known today for ordering the census mentioned in the story of Jesus’s birth. In Who Is This Man? : The Unpredictable Impact of the Inescapable Jesus John Ortberg shows how through the years the teachings of the humble carpenter who grew up in Nazareth have shaped history, science, and western civilization. I am a Christian and familiar with the life of Jesus from the New Testament. This book astounded me with how pervasive the impact of Jesus’s life and teachings have been throughout the entire span of history since his death on the cross. Who Is This Man tells the story of Jesus’s continuing and growing impact on civilization in flowing prose that is easy and enjoyable to read, with a comprehensive bibliography for the scholarly inclined reader. Who Is This Man is a worthwhile read for anyone interested in how civilization as we know it today came to be. When I saw the title of 10 Things Jesus Never Said: And Why You Should Stop Believing Them I needed to know if it was an attack on Christianity or an affirmation. So I bought it for my kindle. Will Davis Jr. has written a book for all the Christians who have doubts that they are good enough for Christ. Through personal trials, the trials of Christians he has known, and Biblical references he shows that Jesus wants YOU. If you have doubts that you are “good enough” for Jesus, this book shows you that you are. We are all sinners and none of us is “good enough” to make the grade, but it doesn’t mattter. Jesus loves us all and has granted us grace, all we have to do is love him and accept it. After reading 10 Things Jesus Never Said I’m still not totally clear what the ten things are. But I do know a great many things he DID say about how much God loves us and is willing to forgive us. Only one man has ever lived a sin free life, and he died on the cross so Grace and Forgiveness are available to you, me, and every other man, woman, and child on the face of the earth. If you believe in God and have any doubts that you will be saved and spend eternity with Christ in Heaven, read 10 Things Jesus Never Said. It will show you that God’s saving grace is sufficient for YOU to be a Christian and be saved. As a Christian I have always been made a little uneasy by the concept of Christian Apologetics. Why should anyone have to apologize for the truth? More recently, however, I have taken the time to actually read some books on the subject. In September, 2014, David Limbaugh published Jesus on Trial: A Lawyer Affirms the Truth of the Gospel which I saw advertised as part of a significant marketing campaign. I was intrigued, bought a copy, and read it. I was impressed and overwhelmed by the volume and variety of the evidence presented for the existence of Jesus Christ, His death, and His resurrection. The book does an excellent job demonstrating that the Christ Jesus presented in the four Gospel books of Mathew, Mark, Luke, and John truly existed and rose from the dead. It also shows the New Testament we have today has remained virtually unchanged from what was originally written. Also, the information in the New Testament matches up seamlessly with the other information available about events in the world during the time of Christ. Jesus on Trial is a powerful book and worth reading. I get email everyday from bookbub.com with Your ebook bargains for Tuesday (or whatever day of the week it happens to be) listing ebooks that I can get for free or for greatly reduced rates. Faith on Trial: Analyze the Evidence for the Death and Resurrection of Jesus showed up in one of those emails. I was intrigued by the similarity between Jesus On Trial and Pamela Binnings Ewen’s Faith on Trial . Both authors are lawyers and both were written to present a case for the truth behind Christianity. I paid the limited time bargain price the bookbub.com email told me about and started reading. Ever since the 1970’s “WWJD” and “What Would Jesus Do” have been popping up everywhere – bumper stickers – graffiti – conversations and more. Where did it come from? It came from In His Steps by Charles Monroe Sheldon, a Congregational Pastor who lived in Topeka Kansas at the end of the 19th century. To encourage people to come back on chilly winter days to the Sunday evening service he wrote stories to read a chapter at a time on Sunday nights. The stories were popular and people came out for the second service to find out what was going to happen next. The best known of these stories is In His Steps, read during the winter of 1896-1897. Making small notebooks the perfect size to fit a pocket from standard composition books is easy and fun. A smart phone is great for keeping track of phone numbers and other info, but it’s good to have a backup. A small notebook that easily fits in a pocket or purse is the perfect way to keep that backup. It never runs out of battery power, doesn’t break if you drop it, and is even water resistant if you use waterproof ink or pencil. 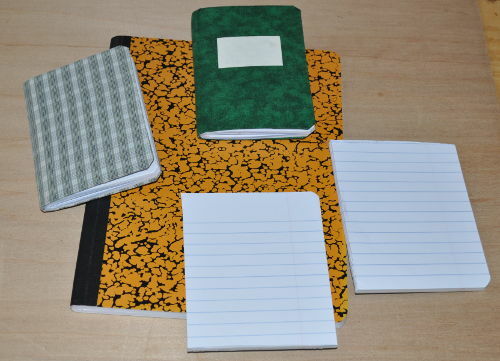 The picture shows two pocket notebooks, two scratch pads, and a composition book like the one that the notebooks and scratch pads were made from. PVA glue is ideal for this project. A good and readily available example of PVA glue is Elmer’s® Glue-All®. Step by step instructions on how to make Pocket Notebooks from composition books. Observing the social scene in America it’s obvious that there is a lot of hate directed at Christianity in General and Christ Jesus in particular. Christianity is being disparaged, mocked, and even violently opposed. Why? It’s because the world has been led astray by evil, falling into the trap of moral relativism where there are no such things as Good and Evil, merely what is expedient at the moment. Jesus and Christianity point out that this is false. There is Good. There is Evil. The right path is pointed out by Christ Jesus, both by his actions and his teachings. Other paths lead to sin, and sin leads to death. The world desires to carry on however it pleases, without interference from old fashioned, antiquated concepts of behavior. Criticism is bigoted, racist, homophobic, even intolerant, and positively not to be allowed. With these conditions prevalent in the world, Jesus’s words from John 7:7 state plainly why the world hates Him (and through Him all Christianity and Christians.) “Me it hateth, because I testify of it, that the works thereof are evil.” The words of Christ burn within the heart of the world because they are truth and truth must be destroyed. Faith in Christ is more than the mere acknowlegment that Jesus is God, for as it says in James even the devils believe. “Thou believest that there is one God; thou doest well: the devils also believe and tremble.” (James 2:19 KJV) The devils tremble because they don’t have faith and so won’t be saved. Love of Christ is what elevates mere belief to saving faith.